Porcelain veneers and porcelain crowns are two quick and highly realistic ways to improve the look of your smile. Both are natural-looking and durable, and are fitted in two appointments. Dental veneers are thin slivers of porcelain that fit over your natural teeth to mask minor imperfections. They are similar in concept to false fingernails. Veneers are a perfect solution for many cosmetic dental concerns. They can disguise teeth that have been stained by food, drink and habits such as smoking, can cover up minor gaps and can hide minor problems with tooth alignment when orthodontic treatment is not an option. 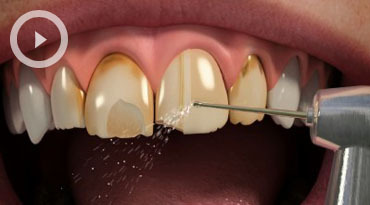 Veneers can also be used to cover up small gaps between the teeth. If one tooth is slightly out of position, a veneer can sometimes be fitted to bring it into line with the others. As well as making your teeth look healthy and natural, veneers require very little preparation of the teeth, meaning they are a quick and easy way to give yourself a smile makeover. If you opt to have veneers fitted, Dr Rana will first gather all the information needed to create them, thoroughly examining your teeth and taking photographs and x-rays as necessary. She will also take impressions of your teeth. The colour of your veneers will be closely matched to the natural colour of your teeth, and they will be made up at our laboratory. When they are ready you will be called back for a second appointment to have them fitted. Porcelain crowns are ideal for restoring teeth that have been severely damaged by decay. They provide your tooth with extra strength and, unlike traditional crowns, look entirely natural with no black line at gum level. First your tooth will be prepared for the crown, removing any decay and shaping it to fit the crown. Impressions of your tooth will be taken and a temporary crown fitted while your permanent crown is made up. We will choose a shade of porcelain that matches closely to your natural teeth. When your crown is ready we will carefully fit it to your tooth, leaving you with a stronger tooth and a natural, healthy looking smile. All of our porcelain work is covered by a five-year guarantee, subject to terms and conditions. Please contact our friendly reception team for more information.